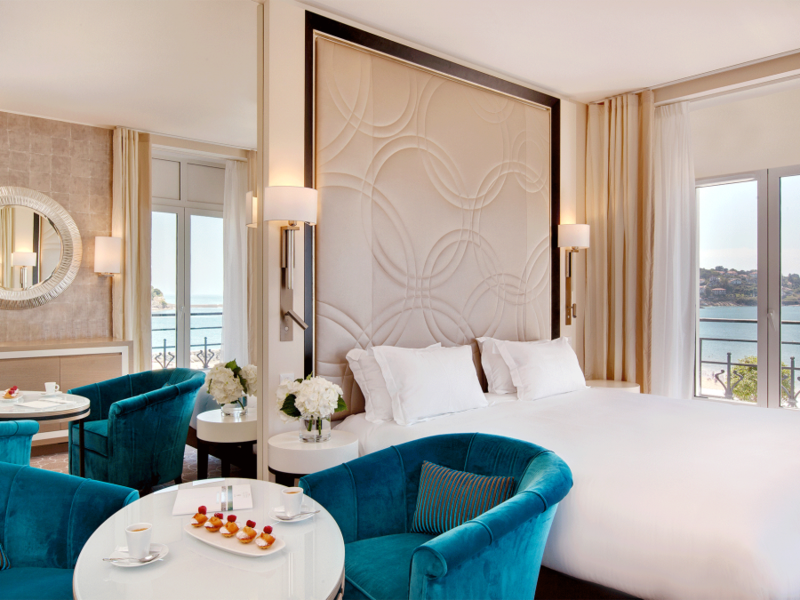 Recently renovated, the Grand Hôtel de Saint-Jean-de-Luz has kept its riches of yore, its coffered ceilings, its marble with cabochon inserts and its grand wooden staircase, all in a redesigned and modernized ensemble. With its elegant Art Deco-inspired decoration, it reveals the discreet luxury of a charming 5-star hotel at the heart of Saint-Jean-de-Luz with a breathtaking view of the Atlantic Ocean. The Grand Hôtel’s history dates back to the 19th century, when Saint-Jean-de-Luz, a port up until then specialized in whaling and cod fishing, gradually transformed into a seaside resort. Napoleon III and Eugénie, started to receive the royalty and world’s elite there. The imperial couple gave substantial aid to build the city’s protective dikes. However, Saint-Jean-de-Luz’s tourism facilities were only built in the late 19th century and began to develop under the influence of a large British colony. One of the hotels built at the time, L’Hôtel Terminus, dominated one end of the city in the beach’s dunes. This is the ancestor of the Grand Hôtel. The Hôtel Terminus was destroyed by a fire in 1904 and had to be entirely rebuilt. It was transformed into a larger and more luxurious establishment that was named Modern Hôtel. In 1982, the Modern Hôtel was eventually put one sale. It underwent significant transformations and its upper floors were transformed into apartments. The hotel was rehabilitated and reunited with its former glamour, and was renamed Le Grand Hôtel. A seawater spa, Loreamar Thalasso & Spa, was added to the hotel in 2007 as a nod to the old bathhouses of Saint-Jean-de-Luz.